These worksheets are great tools for teaching kids to count by 5s. Count five, ten, fifteen, twenty, twenty-five, and so on. This number line teaches students to count by fives up to sixty. Count by fives to find the total number of items in each set. The Antarctic penguins are lined up to show the numbers on their bellies. Count by fives and tell which numbers are missing. 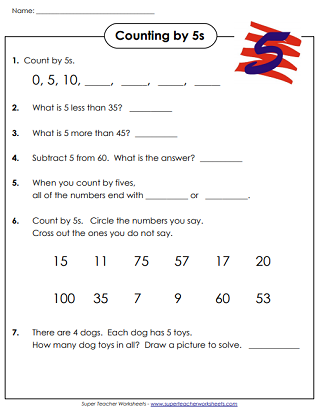 On this worksheet, students count by fives and write the numbers that are missing. Five pictures of goofy golfers decorate this page. The helium balloon pictures have numbers written on them. Skip count by fives to continue numbering the balloons. Count the nickels and write the money amount. 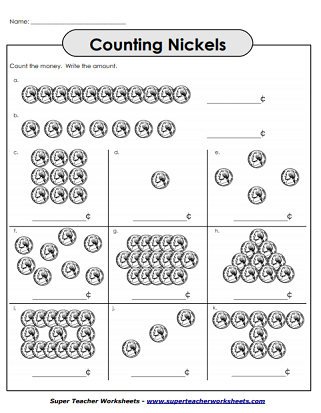 To count the amount of money each group of nickels are worth, students will count by 5s. This page contains a series of word problem questions about skip counting by 5s. 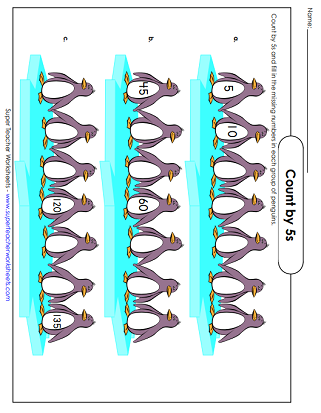 Challenge your students to count by 5s with this printable skip counting worksheet. Skip count by 5s in order to complete each section of the caterpillar. Color in every fifth number of this hundreds chart. Do you see a pattern? Connect the dots as you skip count by 5s, from 0 to 100. The finish picture is an elephant. Skip count by 2s, 3s, 4s, 5s, and 10s. When teaching place value and counting skills, these hundreds charts can be very helpful. Teach students to count forwards and backwards with these counting worksheets. They feature two, three, and four digit numbers. If your students are still learning the most basic counting skills, these 'one through twenty' worksheets should be able to help.